Nearly a year after the first tests were spotted on Freeview, BBC Local Radio appears to be ramping up its roll-out on the digital terrestrial television platform. In April 2014, BBC London and WM went live on Freeview in their respective TV regions. Then in December, BBC Radio Bristol was added in the West TV region. BBC Local Radio is assigned Freeview channel numbers 719 to 722 in England. Now, tests using hidden streams, not tunable on most devices, have been observed in locations across England, including BBC Radio Devon in the South West TV region, BBC Radio Manchester in the North West and BBC Radio Leeds in the Yorkshire TV region. 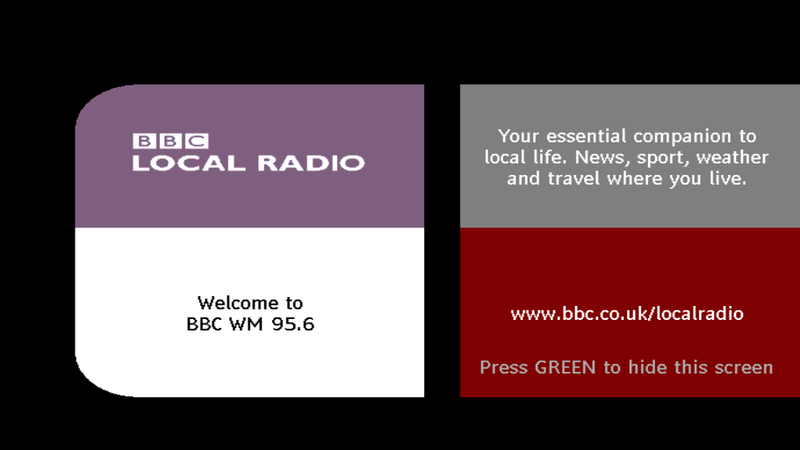 In all cases, the BBC Local Radio station co-sited with the relevant BBC regional TV service is the station being tested, with apparent capacity to add further local radio stations later on. The BBC has so far remained publicly silent about the current tests and when these services will be officially available to all Freeview viewers. "The BBC is currently exploring options for making this and other Local Radio services more widely available. Further announcements on plans are likely early in the New Year." Roughly speaking how many radio channels make up one TV channel - it's only a handful taken off air to create BBC Alba isn't it. If the BBC really really really want BBC1+1 perhaps it's time to deliver the radio channels through Connected TV and clear space for another stream on their SD mux. The BBC generally run their radio streams at 256kbps (MPEG-1 Layer 2 Audio aka MP2). BBC One (which usually gets priority over other services) runs at an average video bit rate of 2.7 Mbps (measured over the last six weeks) and also carries a 256 kbps audio stream, plus a 64kbps mono audio description stream and a variety of data streams. (source). It's around 11 radio stations' worth of capacity. My recollection is that the bitrate of the radio stations, that aren't taken off air completely, is reduced when BBC Alba is running. From 256kbps to 192kbps. Which mux are these radio stations on? And as for moving the radio stations to connected TV, I record Radio 3 programmes on my Freeview PVR since my broadband is too unreliable to stream Listen Again radio. I need download capability, which was removed from iPlayer radio stations some time back. If the radio stations are taken to Connected TV, I'll be back to using my S-VHS VCR with it's timer to record Radio 3 FM out of my tuner. Which is ridiculous in this day and age. The tests are on multiplex PSB1/BBC-A. Yes have to agree streaming can be great for radio if your connection is up to it. Gladly mine has not given me any problems, thank you virgin cable not too often people say that. On the other hand my neighbour struggles like Billy oh with iPlayer services and even radio streaming at times. I'm afraid those of us with good connections often forget that everyone is not in the same boat so local radio over freebies I'm sure would be great for many. Should have made it clear my neighbour is not virgin and relies on BT infrastructure and Sky. Believe me I'm fully aware everyone isn't up to speed broadband wise, but unlike TV channels at least if radio on Freeview switched to being delivered over the internet people would still have the option of listening to the radio through - well, the radio!